It’s not often that many of us East Enders head into New York City — the trip involves too much traffic and confusion, too many train schedules and noises for ears that are used to the gentle lapping of the Peconic Bathtub. But this past weekend, I was on a mission, and the mission was quite simple. 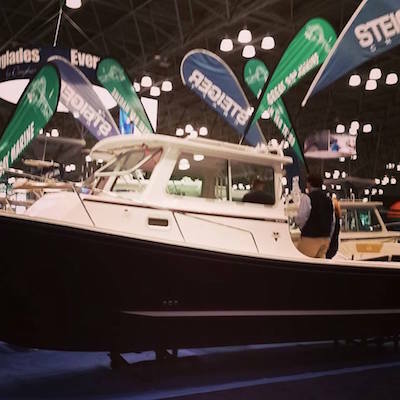 I was going to figure out what the oldest boat show in America, the New York Boat Show, was all about. Now down on the West Side, in the High Line construction zone of steel and glass, is the Javits Center, which is just about the biggest convention center you will ever see, and just as I was arriving there, Governor Cuomo announced that he’s going to make the place even bigger. That is good, because these big fiberglass boats are just getting bigger and bigger, just like the boats that float around in our little Peconic Bathtub, cruising back and forth from Sag Harbor to Greenport before getting bored in our waters and heading out to Block Island or Newport or the Vineyard or wherever it is they go when they leave our little estuary. I was struck by the fiberglass expanses of the Sea Rays and Chaparrals, banged the sides of the foam cored unsinkable Boston Whalers and entered in a sweepstakes to win a SeaDoo even though I don’t really have an interest in jet skis (the girl who was giving it away looked like she needed to talk to someone). I stood in front of some Ranger Tugboats and marveled at their colorful cuteness and their hefty price tags, just like I do whenever I pass them outside of Dave Bofill Marine on County Road 39 heading to Southampton. The red one, especially. You must have seen it. It’s beautiful. I imagined myself catching a shark from the big cockpit of a Grady White. It was all just very overwhelming for at least the first hour. And then I realized there was a rhythm and a soul to this place. It started when I passed the Steiger Crafts the first time. And then it continued when I passed them again. Built in Bellport, these solid pilot house boats just sing of their seaworthiness, and their friendly sales staff let me poke around inside their floor models. I’m going to try to convince my mother to buy one. She needs a boat, and a Steiger Craft would be the perfect flagship for the Peconic Bathtub’s crew — big enough for fishing and company, warm enough to take her out even on January days like today. Well, maybe not today, with a gale force wind pushing down on us and the wind chills dipping the mercury down to single digits, but maybe on a day like yesterday. Maybe. I was walking through this fiberglass jungle, when a familiar face caught my eye. I turned back, and there was the crew from Port of Egypt in Southold. I realized I was face to face with Mindy Doroski, who now works at Port of Egypt but whom I had last seen when I was a second grader in the Greenport school. She had even come to my birthday party that year. I guess neither of us had changed too much, because we recognized our second grade selves immediately. That’s the kind of fluid connection that always seems to find its way back to you when you are near the waters that connect us all. I kept on walking. 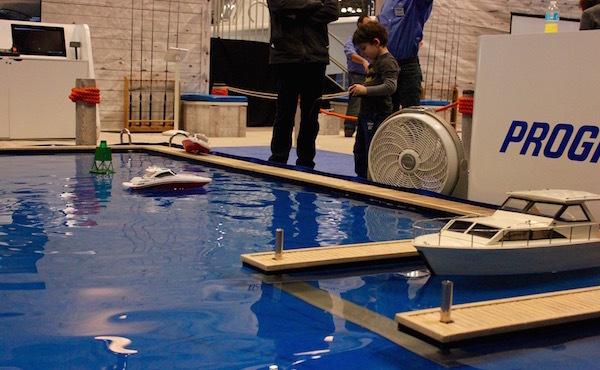 There were kids docking radio-controlled boats in a kiddie pool, and there were Hobie kayaks and paddle boats to see. I talked to a Coast Guard Auxiliary recruiter (I guess they probably aren’t called recruiters), because I think I’m too old now to join the Coast Guard, but man, I wish I had. Aight, Flo, I got this! I learned that the best place to buy bucktails is from the Bucktail Boys at www.Bucktailboys.com. They offer overnight shipping and great prices, especially if you’re a captain. Which I’m not. Yet. I met a woman named The Sailbag Lady (https://sailbaglady.com), who gave me a design sheet to design my own burgee. This was more exciting than anything. She had a stuffed parrot on her shoulder but the parrot didn’t have a name. I decided I was having too much fun, so I hunkered down in insurance corner, by the Progressive people who were offering all kinds of safe boating tips (Flo wasn’t there. I checked). They had a knot tying station and I dutifully practiced my half hitches and clove hitches and cleat tie-offs and such. I agonized over the fisherman’s bend for far too long before I realized, as someone who has never caught a fish, that I have no business tying fishermen’s knots. I booted up my bowline hard drive and made the rabbit go down the hole. I tied all the knots in the knot demonstration area into bowlines and then walked away, feeling the biggest sense of accomplishment I’d felt all day. The only reason I can tie a good bowline is because that’s the knot you need to tie banners to the back of banner airplanes. I spent one summer as ground crew for a banner pilot at Gabreski Airport. He told me if I didn’t tie that bowline correctly the banner would destabilize his plane and kill him. That is how you learn things when you are as stubborn as I am. 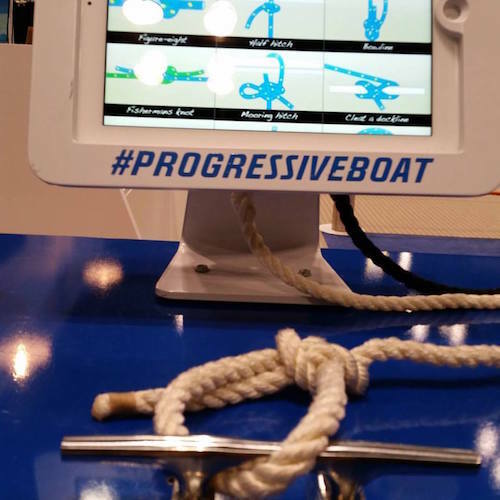 So I stubbornly walked across the boat show hall and devoted myself to fishing school, where I spent some time learning about lures and bottom fish and bottom types and sinkers and weights of lines and whatnot at a series of awesome fishing demonstrations sponsored by The Fisherman magazine. Captain Joe Paradiso talks stripers. 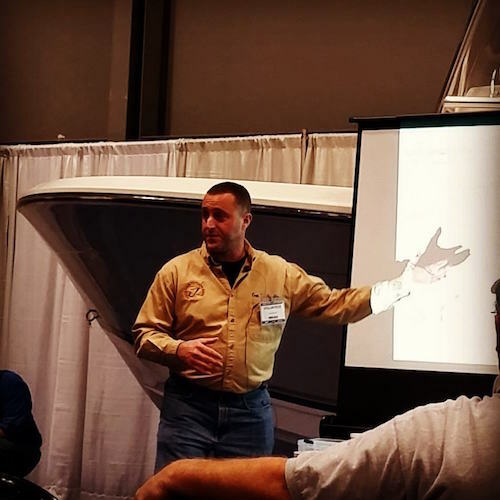 Greenport fishing charter captain Joe Paradiso gave a great talk about striped bass, fishing the tides and currents in Plum Gut, and the secrets of the Orient three-way bucktail rig. He also takes passengers out on a beautiful 28 foot Albin Downeaster, one of those boats with big pilothouses that, as I said before, I believe my mom would love. The Fisherman is printed in a big print shop on William Floyd Parkway in Shirley. You may not know it, but that print shop, Mid-Atlantic Graphics, also prints just about every newspaper on the East End of Long Island. I sat up there in their parking lot on the tailgate of my pickup truck on many Thursday mornings watching the sun rise over The Fisherman‘s logo, waiting to deliver another load of newspapers out to the fish’s tail of Long Island and wishing I had once upon a time caught a fish. Perhaps some of that paper ended up back wrapping fish. All of these streams lead back to the big open sea. I guess I wish there were more sailboats at the New York Boat Show, but maybe it’s difficult to fit their masts into the Javits Center. And maybe I wanted to see a Downeaster or two. But I guess I’m old-fashioned. The good thing is, the show was an old-fashioned good time. I could have stayed all weekend, but I had to get home. I’d already been away from the Peconic Bay too long.